Teeth whitening is one of the most popular cosmetic procedures in the UK. Last year over a 100000 people underwent professional teeth whitening in the UK. Tooth whitening has a proven track record for safety and has been in use especially in the USA for over 80 years. Some Facts To Remember If You’re Considering Teeth Whitening. Always get a dental professional to whiten your teeth, only they have the appropriate knowledge, training, and adequate safeguards in place. At Circle Dental, we are one of the leading teeth whitening centres in Trafford. We use a product called ‘Boutique Whitening’, we have had great results with it, with minimal sensitivity. But remember, teeth whitening works at varying degrees in different individuals sometimes you may need a longer course of treatment for a marked improvement. However with our regular 2 week course there will always be an improvement, provided all the instructions are followed. There are different ways to whiten teeth. Sometimes just a thorough scale and polish by a hygienist can lighten teeth by getting rid of the stains. Some toothpaste specifically marketed for teeth whitening may be abrasive and may damage tooth structure. The most effective tooth whitening is the take home whitening. In-office whitening (or Laser Whitening) gives an initial boost but is not as effective or longer lasting without additional home whitening. Using sensitive toothpaste for 2-3 weeks before starting treatment can help; some people experience more teeth sensitivity than others but it is quite normal. If you have sensitive avoid laser whitening. You don’t need strong whitening gel for effective results. Research shows low percentage gels to be safe and as effective. Teeth whitening doesn’t last forever and usually, you need topping up after 6-18 months. Keeping your trays safe and stored on models (when not in use) helps retain their shape and reduces costs for future treatment. Dental Crowns, Veneers or white fillings do not whiten during treatment and you may need these replacing if there is a mismatch in colour following the treatment. Teeth are porous so they can pick up stains like sponges, whitening works by pushing out stains accumulated over the years. You may need combination of teeth cleaning and teeth whitening to get the best results. 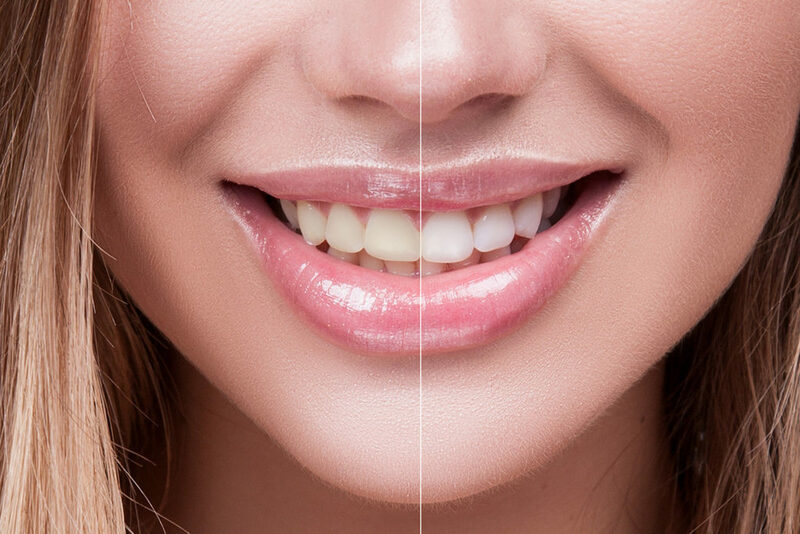 Sometimes the staining can be deeply ingrained in the teeth for example from antibiotics use during the early years of teeth development, this type of staining is harder to treat and may need prolonged teeth whitening. To book your teeth whitening consultation at your dentist in Stretford, call us on 0161 748 2605.